On July 15, 2013, the day of announcement of the unjust verdict of Professor Ghulam Azam in the so-called war crimes case. Jamaat announced a countrywide shutdown in protest. Hartal was observed peacefully in Chapainawabganj. Ziaur Rahman took part in the strike during the fasting days. At 1pm, police-BGB recklessly fired upon peaceful protesters. 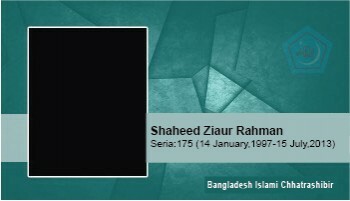 Ziaur Rahman was seriously injured and attained martyrdom at 3pm on his way to Rajshahi Medical College.